Francistown is oldest town in Botswana and is considered by many as the capital of Northern Botswana. It is conveniently placed as a stop over City between the Southern part of Botswana and the major safari destinations(Okavango , Maun,Kasane, Moremi Game Reserve...to name a few) found in the Northern part of Botswana. Nyangabgwe Hill - The hill offers great views of Francistown. Apparently there is an ancient wall that dates back centuries ago half way up the hill. Nyangabgwe is also the traditional name of Francistown. Birds and Game - This an animal orphanage for injured animals and birds operated by Uncharted Safaris.Even though the animals and birds are released back into the wild when they heal, it’s still worth checking out. However, keep in mind that you may not see anything because it all depends if they have any injured animals when you visit. Much of the History of Francistown has to do with the colonial times and the mining of Gold that was done after the discovery of Gold deposits in the area in the late 1800's. In fact, if the Discovery of Gold deposits in the Francistown region weren’t discovered, the city as we know it today probably wouldn’t have existed. In the year 1885 the British officially become the Protectorate of Botswana, which was called Bechuanaland back then. This led to the British setting up administration centers in Botswana. This railway line was actually part of the Cape to Cairo railway planned by Cecil John Rhodes and the British. The plan was that the railway line would just pass through the Francistown region and straight to Bulawayo, without having a station of any sort in Francistown. However when Gold was discovered by the European settlers in the Francistown region, they decided to build a formal railway station. That was the beginning of Francistown. Actually, the City was named after Daniel Francis who was one of the founding directors of the Tati Concessions Limited Company, which was the company that owned the land surrounding the railway line. The company was formed with the permission of the British government, Botswana's Protectorate at the time. The Tati Concessions Limited Company owned the land that was to become Francistown, and in August of 1897, they sold part of the land for residential and commercial purposes. That day marked the official formation of the Francistown. So essentially, Francistown was formed as a mining town. The mining of gold sustained the economy of Francistown from the late 1800's till around 1930's. Unfortunately this gold mining boom came to an end during the global depression of the 1930's. From 1936 to 1980, the economy of Francistown was largely dependent on the The Witwaterstand Native Labour Association, which was a company that recruited labour for South African mines. These mine workers were recruited from many African countries, and were transported to South Africa via Francistown either by plane or railway. The gold rush in Francistown in the 1800's was one of the first Gold rushes in Africa and the first in Southern Africa. The photo below shows a Baobab tree (the independence tree) in the park that was planted in 1966 to mark the independence of Botswana. 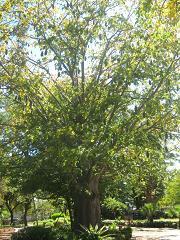 The tree was planted by Mrs Kathleen Mincher who was Francistowns's first mayor. If want to learn more about the History of Francistown and that of Botswana then you might want to take the walking guided tours offered by the Supa Ngwao Museum in Francistown. Click here to read about the tour of Francistown that i took. You can also visit the Domboshaba Ruins which are located about 80 kilometers from the city. These ruins show ancient culture of the Bakalanga people of Botswana.